I am not sure how I found out about this 10k, but there were online entries with a few days to go, it was relatively non expensive and I had a free morning. Steph circulated about a lift on facebook (being the dinosaur that I am, I do not do facebook) and I circulated on email and we managed to co-ordinate and went in one car. (Apologies Philip – only just realised we were three of us). Another Sunday started “cool” but it was dry and by the time the race commenced was just about warm enough. We arrived early to what turned out to be a pleasant low key event. Recycled numbers (good eco score) (so despite what it says on the numbers in the photo it was not a half marathon) and a few people multitasking jobs. We greeted Tom as he arrived with his youngest to tackle some mountain biking course and we made our race preparations. Resting, changing shoes, warming up and other pre race essentials. The runners assembled off the road and were then led the short jog to the start. There was slight delay for the start, to set up the timing mat across the “main road” through Hamsterley. I told you this was a good low key event. One of the runners had to test it so see if it was working. We were sharing the route with the traffic – I think I counted about 5 cars in all. Those expecting something hilly, multi terrain and off road, like other Hamsterley events, would have been disappointed. Steph unfortunately had made a strategic wardrobe mistake and did not have her road shoes, so competed in trail shoes. (She was not too pleased about that). The course was a straight out and back along the tarmac forest drive for a couple of miles, then onto the fairly gentle uphill non tarmac but perfectly runable road. Thanks for the cheer Tom! The turn was at the top, at about 4 ½ K, along with a water station. Then it was down and back to the finish. My plan, such as ever I have one, was to try and be steady but the geography allowed for what may well have been an SB 5K (possibly about sub 20) for the downhill second half and two minutes quicker than the first 5K. The field was quite small (under 100), I was well up and finished somewhere in the top 10 (see below). No massed crowds at the finish but clapping, cheering and a warm reception for all – not quite the same as those running a somewhat bigger event in the capital. As I came to the finish, the timer had just clicked over 42 minutes so almost half a minute quicker than last week’s Sand dancer. I was pleased. 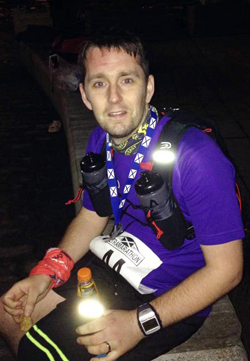 There was a bottle of water, a medal and even a photo – which went up on the run-nation website. I Jogged back to give Steph a cheer – who had an excellent run in the “wrong shoes”. I missed Philip – but well done. Apparently there was some chip timing malfunction and my result was omitted. Fortunately some email correspondence followed on Sunday afternoon and the missing time has been found and the results amended. So now I am looking forward to next week and the challenges of a half marathon. To us Brits there’s probably no bigger race than the London Marathon. 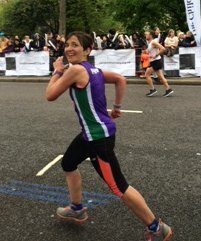 I can’t pretend I grew up particularly obsessed with it or anything because I grew up as an overweight child with very little interest in anything sport-related – if you asked anybody I went to school with who was LEAST likely to run the London Marathon they would all have agreed it was me. However even as an anti-sporty type I was aware of it and heard of various (obviously insane) people who ran it. When I qualified for a good for age place last year I wasn’t absolutely sure I wanted to do it. I’m not mad about road races and my previous marathons hadn’t gone particularly well. However, having joined Striders in the Autumn I decided it was worth trying to do it properly. I’ve spent a lot of my life living and working in London; my family all still live in and around London – so it would be an opportunity to get everyone together as well. 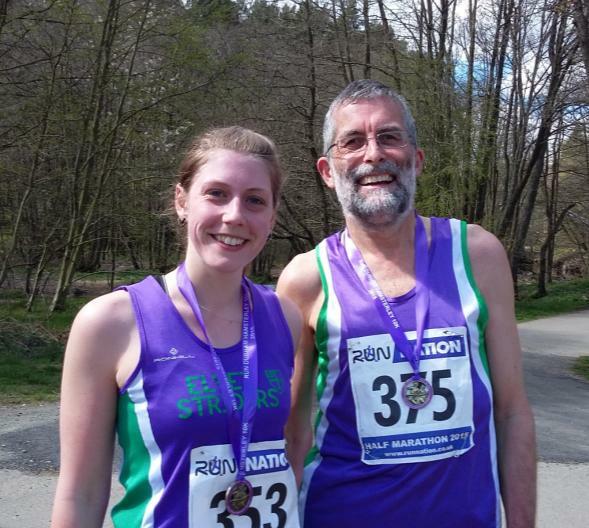 Training went well – PBs at half marathon and 5k and a good Cross Country season – everything was looking good. However, a few days before the race I heard people talking about it on the radio and surprised myself when I started welling up. This was to be a theme for the next few days. I spoke to my parents about where they’d be on the course and I felt emotional, I looked at the weather forecast and I got a bit shakey. It was all becoming too real. We stayed the night before the race in a hotel about half an hour from the start. I woke at 3.30am and was totally unable to get back to sleep. On the train and at the start I tried to hold my emotions in but everything seemed so big and I was so aware of the time and effort that had gone into this day, it was hard to stay calm. At the start I met a friend who was pacing 3.45s and we enjoyed the atmosphere and meeting various oddly-dressed runners, including one dinosaur, whose costume must have weighed a ton. Anyway onto the race itself. The start was very congested and quite stressful. All week I’d been saying I was worried about the start and the finish and I just wanted to get the first few miles done. I knew I was going faster than planned but I needed to get away from the crowds. Plus after a week of scarcely running I wanted to stretch my legs a bit! After a few miles I settled into my planned pace and felt good. At around 9 miles I heard a shout from my parents who looked utterly thrilled to see me. I gave them a wave and then felt a wave of emotion and tears getting the better of me. I couldn’t start crying at 9 miles! I tried to get a grip and managed to get my breathing back to normal but was aware of just how on edge I was still feeling. I had a similar reaction to going over Tower Bridge (such an iconic landmark and also near the halfway point) and then seeing my brother. At this point I was so relieved we’d decided that my children would just come to the end rather than cheering me on around the course. With this level of vulnerability my kids would have sent me right over the edge! Highlights on the course were the Cutty Sark, Tower Bridge, crossing the elites on the out and back section (wow, they looked amazing! ), the tunnel of hell at around Mile 23 and the final section along the Embankment and up Birdcage walk – an area of London I have walked around countless times. But the real stars of the London marathon are the crowds. Unlike anything I’ve experienced before the noise at times was deafening and their passion overwhelming. From a running point of view, things got tough from around Mile 18. I knew the last third was going to be the hardest and I over-compensated with my fastest mile of the whole race at Mile 19. After this I was just holding on. I couldn’t stomach any more sweet energy-giving concoctions and was even struggling to take sips of water but knew I was getting weaker. I kept telling myself I could have a little walk when I got to the next mile marker but on each occasion the crowd kept me going so I gave myself another mile before the walk. Somehow this got me through to the end without ever stopping. My pace dropped a bit but I was delighted to have done it with a PB of 16 minutes. After the previous week’s slog around the mountains of the Newlands Valley in glorious sunshine and expansive views, arriving at the start for the Yorkshire Three Peaks fell race couldn’t have been more different. After an early start to meet fellow fell runner, Danny Lim at Scotch Corner we arrived in Horton in Ribblesdale feeling quite nervous as the thick mist and persistent rain added to our tensions about this race. Dubbed the marathon with mountains, the Three Peaks, now in its 61st year, with its strict entry criteria (all competitors must have completed two AL fell races under FRA rules) and tight cut-off times ensure a strong field is guaranteed. The night before I’d posted a picture on my Facebook of the much fabled ‘Three Peaks Bus of Shame’ which Danny and I were determined not to be one of its passengers. Both running this for the first time we were unsure of what to expect. As the start of the race approached and more people arrived the excitement and tension in the air was almost tangible as we packed into the huge marquee to keep out of the cold and wet weather we were blessed with. 10:30am and we were off, snaking our way up the lanes and tracks heading for the first peak of Pen-y-Ghent. The field of 802 competitors soon spread out as we made our way up into the thick mist. As the track got steeper and we slowed to a walk, out of the mist I heard ‘Get out of the way! !’ I looked up to see (very briefly) Ricky Lightfoot hurtling back down the path towards us. That’s as close as I’m ever like to get near him! He’d reached the summit in 28 minutes; it would take me 47 minutes to get there. After reaching the summit checkpoint it was lovely long run back down and off to Ribblehead, where there was a strict cut-off of 2hrs10mns. 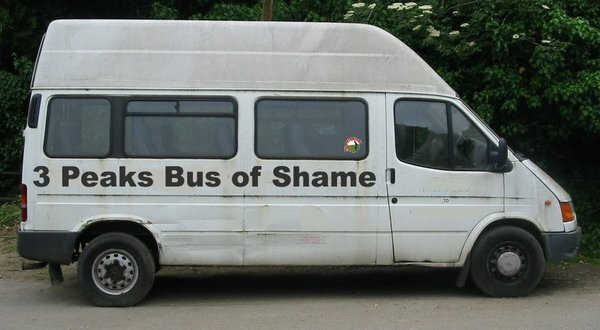 I got there in just under 2 hours which meant I was spared the ignominy of the ‘Bus of Shame’ for now! Collecting the first of my two drinks that are transported to the sight I took a moment to savour the vast support that had gathered at this checkpoint and grab a view of the glorious Viaduct that crosses the valley before heading off. I was feeling really good and felt I was pacing the race well at this point but still had visions of the ‘Bus of Shame’ waiting for me at Hill Inn which was the next main checkpoint. By now the persistent rain meant that everyone was pretty much soaked and coupled with the strong wind, staying warm was getting more difficult. We snaked our up the valley towards our second peak, Whernside. Here we crossed under the railway line and over a track that led to a stream crossing with no other way over but to wade straight through. Knee deep and very cold, I was not at all pleased with this then it was a long, soggy, muddy trek straight up the side of Whernside. As I approached the summit, the incline got near vertical requiring all fours being used to haul myself up to the top. Once at the top there was no time to hang around and picked up the pace to get off as quickly and safely as possible. The route down is via a narrow stone track that was littered with walkers who made the descent just that little bit more treacherous. Once back in the valley the track meandered its way to Hill Inn, the next of our two drop bottle points and the last cut-off for the ‘Bus of Shame’. I made it in good time and picked up my bottle of coke (or liquid gold as it’s know at this point in the race). I turn and see Danny, he’s made it too, still smiling but stating he was feeling very tired. We set off together in high spirits for our last peak, Ingleborough. On approach, for the first time the mist and low cloud has cleared enough for us to catch a glimpse of the summit and the stream of people making their way to the top. I press on up the very steep track towards the summit plateau where, on cue, the cloud drops, visibility is reduced and then to add to the mix, it starts to snow. I reach the summit checkpoint and turn and make swift my descent. God bless Inov-8 mudclaws as I make good, sound progress off the summit for the final, muddy run back to the finish in Horton. I buzzing as I’m able to move at a decent pace and keep close to a guy and girl using them to keep going. On the final approach we’re directed through some very kind person’s back garden, across the road and into the finish field where, I’m attacked by two runners for a sprint finish. Back in the marquee a band is playing and delicious 3 bean chilli is handed out to warm weary and cold runners. Danny soon follows in for a strong finish. In all, this is one of the best races I’ve done, loved the atmosphere and the route is brilliant. The organisation was spot on and my sincere thanks go out to the marshals who stood out for hours in awful conditions to man each and every checkpoint. I’ll definitely be back next year. A warm sunny night with spring offering a glimpse of lazy summer evenings and the backdrop of Hardwick Park with its lakes, wildlife and Victorian follies - how do you improve on that? For some perhaps the gentle tones of Gilbert and Sullivan; others may look to the words of William Shakespeare acted out but surely 480-ish folk in lycra sorted into teams of four-ish hurtling around the paths , tearing over bridges and hustling through the woods is Nirvana for those in the know. A fair few striders had got together - including a few speedy chaps and ladies - and I was looking forward to watching them run and trying to do likewise (though at reduced velocity). The usual scrum/mild panic of getting teams gathered together seemed to go OK (hats off here to Sedgefield Harriers, patient and calm folks at the tables accepting entry forms) and we gathered by the start. From here I can only offer a personal recollection of the course and it would be hard to list all those running, though honourable mentions to Denise Davies and Lindsay Rodgers for doubling up and running the first and last legs for their team as people were detained at work, and to Angela Greathead, who stepped in almost as the first leg set off to take the mantle of second team runner and complete the numbers. So to the race: Malcolm Sygrove had given our squad a solid start and came home strongly in mid field, handing over to Angela ( who looked to be motoring at a fair lick from my vantage point), Paul Swinburne took over duties and seemed to improve our place in the rankings as he powered through to the finish line. A marshal called out I could go and so my race began: the strange thing was starting alone with only one runner, maybe 60 metres ahead, for company. The good thing about this was having a target to aim at. Unfortunately I was also a target and was passed just after the first major spectating point. 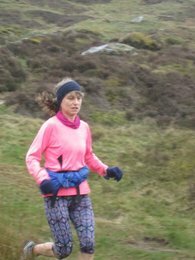 The run round the lakes at about a mile showed places were there for the taking and I saw Elaine Bisson closing rapidly on folks ahead. All in all the night was a great, short and sharp, work-out made all the better by the company of 30 Strider club-mates (as well as those who had come along to shout encouragement). There were entries on the day and it is not far from home, the weather looked favourable and there was an email about lifts. A car full of Richard, Helen, Fiona and I set off on a chilly Sunday morning to the breezy North Sea coast at South Shields. We were early, so there was no queue and Fiona and I quickly entered, Richard and Helen picked up their numbers and we went back to sit in the car and admire the waves and the clouds with the heater on. Those that arrived later had quite a queue for their numbers. As we waited the weather improved and it turned into a glorious sunny but breezy Sunday morning – just the day for taking a stroll along the cliff tops. At the allotted starting time we were advised there was to be a 10 minute delay, which turned into just a couple of minutes. We were off – along the foreshore road and gently up onto the paths around the cliffs. The route is essentially out to the green patch, twice round and back to Gypsies Green stadium (near the end of the GNR) for a finish around the track. The weather had been dry so the paths were dry and the going “good to firm”. I set off trying to go evenly, as I have a plan for a half marathon in a couple of weeks. 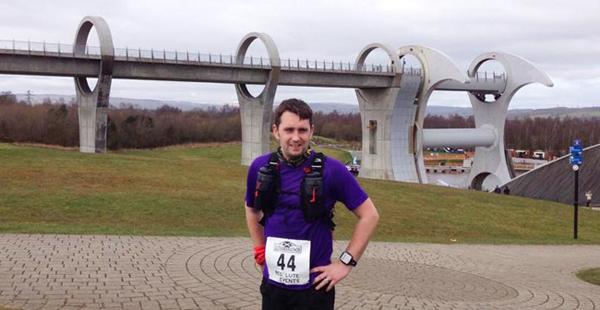 None of this marathon and ultra for me – 10K and a half are far enough. The legs felt good and the running steady and with a bit of a downhill near the end I had a negative 5K split. There was a bit where the lap almost meets up and as I was ¾ round the first lap the leader was gliding along well into his second lap. It was great to see the sharp end of the race. The wind never really seemed to help but was not too much of a hindrance, seeming to be side on for a lot of the way. Do not imagine the final lap of the track being like running on the track at Maiden Castle. Think more of Alf Tupper and tough of the track for those old enough to remember comics like the "Beano" - compacted mud. For the first 10K of the year I was pleased with my performance, soon to be followed in by Fiona, who because she had entered on the day was ineligible for one of the veterans prizes, Richard, Fiona, Rebecca and Helen who was robbed of the sub 60 by a whisker due to delay in crossing the start after the gun (race not chip timed). Water, a technical T, entry on the day – good value for money. I was surprised there were not more striders – certainly a good morning out by the sea and maybe one for next year. Where to start? 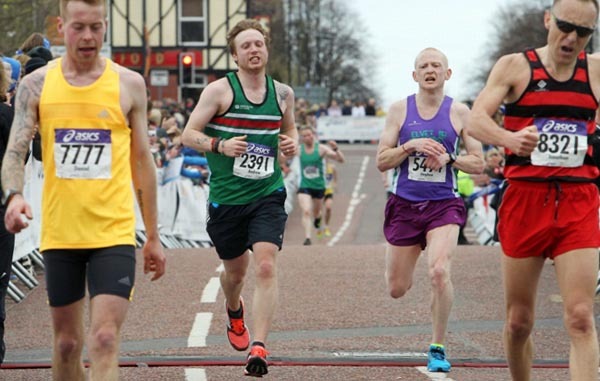 Well, how about the end of my race report for the Ikano Robin Hood Marathon in Nottingham from September 2014: "Never again, I thought, as I noticed there was a reduced price offer for the Greater Manchester Marathon in April 2015. Sub 02.45:00? Now there's a thought..."
Fast forward six and a bit months and I'm lining up alongside the so called theatre of dreams with a host of other Striders for the 2015 Greater Manchester Marathon. Forgetting the iconic football stadium at the start and finish of the race it seems to me this was a route designed to entice runners with a fast, flat course. The date, I assume, was deliberately designed to coincide with London for those who missed out or an opportunity to achieve a PB with the 2016 VLM in mind. Whilst the course was pleasant enough - an 'out and back' loop through the Metropolitan Borough of Trafford - London, with its iconic capital City skyscape, it ain't. That said, the atmosphere was very friendly, the race very well sponsored and organised and the weather conditions almost perfect. Cool but not cold, cloudy and calm - save for a gentle breeze. No excuses. I hadn't been 100% during the week and was a little apprehensive about the race. In hindsight I'd diagnosed myself with a chest infection that was probably a false alarm. Annoyingly, this meant I'd missed Charlie Spedding on the Wednesday evening but the unplanned rest probably did me good. Despite this last minute hiccup I knew I was in pretty good shape. I was 4 seconds off a 5k PB the weekend before the race at a windy Hartlepool parkrun and my training in general meant that my 'easy' pace was gradually creeping up a notch. I'd enlisted the help of Allan Seheult who had put together a 9 week bespoke training plan. I'd worked hard up hills and on the track; I'd raced and I'd rested. More often than not, six or seven days a week I'd pounded the payment near to my home, putting the miles in. This really helped, not just because Allan really knows what he's talking about but also because it meant I was being thorough and reflecting upon how things were going along the way. 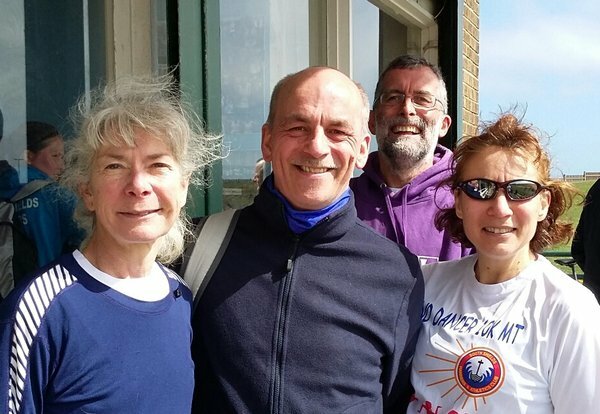 This is a race report as opposed to a training report so I'll not bore people with the details but I'll let you into a little secret, I'd only run 20 miles or more twice since my last marathon - over 22 miles only once. I had a race plan, which of course I didn't follow. I was to run 3:53/km splits and, if possible, increase slightly towards the end of the race. I'd run a negative split at the Brass Monkey Half Marathon in January so that made sense. However, I felt good on race day and went off a little quicker - nothing too radical (maybe 5 to 10 seconds) but quicker than planned nonetheless. Now I don't want to sound like I wasn't happy with the race, I was absolutely, totally and utterly, indescribably elated BUT there is an argument that I was running just below half marathon pace for twenty miles before my inevitable demise at mile 23. I went through halfway in the same time I completed the GNR last September and twenty miles in 2 hours and two minutes. This would have been fine had I maintained that pace to the finish line, but I didn't. Room for improvement, says the perfectionist in me. The last couple of miles were hell. But what doesn't kill you makes you stronger and I most certainly will have forgotten how uncomfortable it was in a year or so. I would certainly recommend the race; it's well organised and it's perfect if you want to run your fastest possible time. There are plenty of drink stations, the t-shirt is canny and the goody bag up there with the GNR. In my humble opinion, decent value for money. Finally, I wanted to say thank you for the incredible support I received in person, on facebook and via text messages etc. It was a privilege to line up alongside so many Striders, many of whom were completing their first marathon. Never again, I thought, as I noticed that I'd recorded a Championship Entry time for the Virgin London Marathon in April 2016. Borrowdale, Keswick, Dark Peak say the vests worn by those milling around the village hall. Then there's me sporting my Striders purple, feeling completely out of my depth. What am I doing here? An early start sees me in the Newlands valley just outside Keswick for the start of the 'Teenager with Altitude' fell race. I'm under no illusions as to how tough this is going to be but with the weather being perhaps more than perfect, I was in high spirits. A bridge closure meant there was a 30 minute walk just to get to the start line which, once reached, spelt out what this race had in store - a near vertical climb up to the first peak, Causey Pike. The slowest start to a race ever, perhaps? I take it easy, there's a long way to go. The top is reached, then a hurtle down off the ridge before cutting off to reach the second peak, Outerside. I take a look behind me, but there's no one there. It dawns on me that I may be in last place, surely not? Peak two, is reached followed by a mad dash down into the valley past the old mine workings before a long slog back up to the summit of Grasmore. The sun is blazing down, the valley is stunning but the view from the top even more so. I'm feeling good as Grasmore summit it reached with a good proportion of the field still in close contact. Off to the next peak, Whiteless Pike - tick. Then it hits me, this now becomes a battle. A ridiculously stomach churning, knee trembling near vertical drop off the side of this peak back into the valley of Sail Beck to reach Newlands Hause checkpoint follows. There's a 2hr 30 cut off here, I've no idea of my time as I've decided to watch my heart rate in this race instead. I've not been stopped from proceeding so I assume I'm within the cut off. Next up is High Snockrigg (don't laugh, that's what it's called and is a serious climb to get up there!). From here it's fairly runnable to the base of Robinson, to which peak we are said to meet up with the Anniversary Waltz runners, a shorter race that starts an hour later than ours. The climb to the summit is beyond ridiculous, in my eyes! By now I've lost sight of just about everyone who was in front of me and there still appears to be no one behind. At the summit I just about have enough energy to fake a collapse, this is getting really tough now. The views over Buttermere are, however, stunning and I press on to Hindscarth before another stupidly steep drop off to Dale Head beck takes me to the final swing north towards High Spy and Cat Bells. My legs have just about had enough now and I struggle on the ups. Day walkers congratulate me as I pass but I feel no pride, I'm shot. I reach Cat Bells in 4 hrs 35 mins, I know the time only because an Australian guy asks "what the hell are you crazy guys doing?" I reply and for the first time check the time. I set away off this peak down the track then glance left, I can see the finish but ahead of me on this ridge there is nothing, I realise I've already been on Cat Bells and now I've missed the drop off. I see a group of three runners on the road below and realise I've made my first navigational error right at the end of the race so the only thing to do is go straight off the side down the steep bank onto the road and back to the finish, in just over 5hrs. On arriving back, Pete Bland's mobile shop is being packed up, probably sold out of spare lungs and replacement knees! In the village hall I stagger for my reward, a free beer and some food - this is what makes it all worthwhile. I thought I was last but it turns out there were two more runners behind me, I've never been last in a race but this one I had no worries about being in that position, in fact I quite enjoyed it. It was a real test and put me in my place. The weather was stunning and the views even more so but next time I think I'll go for the more "runnable" and shorter Anniversary Waltz than this 15.6 mile, 7600ft of ascent beast of a race. It was a dark and stormy night in deepest Northumberland. Well not quite. It was a cold, wet and windy morning and we were at the seaside. I ran this event for the first time last year and really enjoyed it hence it was near the top of my to do list this year. The course is fast and virtually flat, just a few sharp bumps in the dunes. 12 striders had made it to the start ready to mix it with the talent from across the North East. There were some good runners racing and the first 22 all broke the 35min barrier. We were packed in like sardines at the start with lots of chatting I guessed the gun had gone when people started shuffling around me (it must have taken me more than 3 seconds to cross the line, but more of that later). The run past the park is always interesting especially with the bollard encased bus stop, once passed it was time to settle into a pace. In an attempt to stop Ari going off too fast we had decided that I would take the pace until we got to the dunes, then he could do what he liked. The dunes were not as bad as you think there was a good tarmacked path through them, there were a few sharp bumps (10 to 20 strides and you were over them) nothing to slow you down. Then there was the wind, have I mentioned that it was a bit windy, in fact the wind was grabbing hold of you and trying to fling you back from whence you came. That fact that it was windy was the only reason that I kept sight of Sally Hughes for so long. Once you made it back on to the road you had the wind behind you. Can anyone tell me how on out and back courses the wind hinders more than it helps? As part of the run for home there was a nearly 2 mile stretch of straight road with not so much as a nod to a bend. This gives a great opportunity to get into a pace and work with those around you, I have to say thanks to Terry Brown from North Shields Poly for his encouragement during this section. The final half mile takes you past the park and those dam bollards; one day I am going to get it wrong and join the ranks of the castrate. After the park it gets a little twisty and it was here that I lost a bit of concentration (I must have lost at least 3 seconds but more of that later). Eventually you turn a corner onto the quayside and you have 150m left to sprint. Crossing the line stopping my watch which showed 44mins and 56 seconds. What joy a pb by more than 2mins and I broke 45mins. What despair when the official times said 45m 02s oh for those 3 seconds that were thrown away all round the course. Never mind I was only going for a sub 47min and I still beat Ari by a minute, Richard Hockin had to eat my dust and I whooped Malcolm Sygrove. But the best thing was being less than a minute behind Sally, I don’t get that close to her on a parkrun. If I think I was unlucky the Matt Archer takes that prize being only 3 secs off beating 40mins. Well at least he has the pleasure of being the first strider home followed by Steve Trout then Sally in third. Teresa Archer and Gail Craig finished in 1hour and 9 minutes which is impressive for a first 10k in such grotty conditions. Stephen Ellis ( with his Cheshire Cat grin) followed Victoria Brown. Mike Elliott finished just over the hour. It was a tough day with some very good performances. A special mention goes to Blackhill’s Jordan Bell who at the age of 18 came second with a time of 32:23 this boy is class keep an eye on him. 3 Esk valley usual suspects, Jan Young, Danny Lim and Mike Bennett made it to a damp windy Clay bank car park to enter on the day for this event, another in the Esk Valley series, rescheduled from Feb. Only 55 runners turning up on the day. The course may be quite short but had all the ingredients of a testing fell race. The climb being the longest uphill section on the Cleveland hills then a mixture of heather tracks, mud, granite slab paths, and rocky descents. Scenery was great if you dared take your eyes off the track for more than a few seconds without taking a tumble. Marshalls on route at critical points, course was reasonably well marked but a couple of sections where you could miss the route. I did manage to stay on the course this week so avoiding any time penalty. A fast downhill muddy finish, fell shoes tested to the limit. Jan was 10th female finisher and came away with wine, I managed first in age group with Danny close behind. If you can only do one fell race in the North York Moors, Guisborough Three Tops would be my strong recommendation. Highlights include the stunning view of Yorkshire villages from Highcliffe Nab; picture-perfect like a postcard. This is followed immediately by a daring downhill dash into headwind so strong that your snot flies vertically, back into your face! There is the breathless scramble to Roseberry Topping's trig point past amused walkers and tourists. And my favourite bit of all, that slightly insane descent down the steep, grassy side of Roseberry Topping. 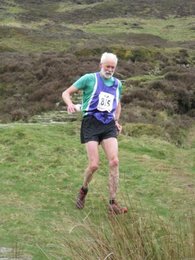 A true fell runner will descend in what would be best described as a "controlled fall". This time, only four Striders braved the start line; which is surprising considering it is a GP race. Mike Bennett was the first Strider home but was stung by a 15 minute penalty for missing a newly introduced loop. Camilla and Jan also finished strongly, perhaps adding to their wine collection? 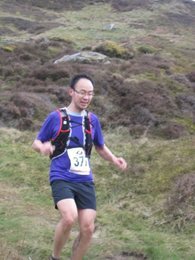 Best of all, this race will take place again this September as part of the English Fell Running Championships. So come on! Sign up now at the Esk Valley Club's website and hope to see you there. 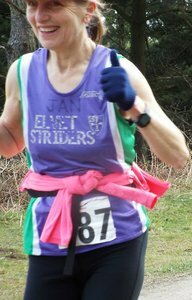 In the Esk Valley Winter series with two races to go, Jan Young is in the lead and Camilla Lauren-Maatta 2nd in their respective age groups. everything to play for. The build up to this race report is a short write up. I counted my 'training miles' since January 1st and I have run a total of 122 miles since the start of the year. So I arrived at the race start line wholly unprepared for what I was about to undertake. I have always been of the mindset that if you put your mind to it then your body will get you there. This is what I was hoping would get me through this run. Anita was hoping that training would have got me through but I have become quite lazy over the last few months. At the start line we spotted Jon and Shirley Steele, the race directors from the Strider favourite Hardmoors races, and said a quick hello before the off. The race started at a very quick pace and I got into a comfortable pace with another runner and started to have a chat. This pace was comfortable for a Wednesday night run of a few miles but I quickly realised I was going too fast and pulled back a little but still managed to get to the first checkpoint at 13.1 miles in just 15 minutes over my half marathon PB. Ooops. Through the checkpoint, full of custard, and I took it a good bit easier over the next few miles to the second checkpoint. The run had settled into a run/walk strategy and it also got a bit boring. The run is very flat and the canal has very little changes of scenery. It was a lovely day though, the sun was out and it was warm but not hot. We left the canal path briefly when entering checkpoint number two (22 miles). This was the Falkirk Wheel which is basically an elevator for canal boats, transferring them from the Forth and Clyde canal to the Union canal. I've always wanted to see it in action but for the ten minutes I was there it was not in use. Anita said that shortly after I left it was used but I didn't get to see it. This was also the first point at which I wanted to quit the race. I didn't feel tired and my legs were fine but my toes were starting to hurt and I just wasn't enjoying the race. I was sitting in the passenger seat of the car and I just wanted to close the door and have Anita drive me home. Off I went though, eating my peanut butter sandwich (I now rarely eat peanut butter for enjoyment as I have sickened myself of it by using it as fuel for ultras) and slowing down a bit more than the previous section. After a few miles I knew I was going to need a shoe change at the next checkpoint. After only a few miles I came to the entrance of a tunnel that had all kinds of warnings and signs outside. It turned out that the tunnel was about half a mile long and had lots of leaks coming through the roof. I can imagine that it has regular safety inspections and the like but I thought it was ready to come down any time. There were even big holes in the ceiling that you couldn't see the top off as it was so dark. I've never been so glad to be back into daylight and I also decided that I wouldn't be taking up Spelunking (it's a real word that). The only other thing of note I saw on this section was two ducks having a race. Two male ducks came flying past me and flew up to an orange buoy and landed in the water before turning round and flying straight back to where they came from. I'm sure they were having a race. What else can you do on a bank holiday weekend if you're a duck I suppose. Into checkpoint three (33 miles) and I was miserable. My feet were aching and I asked Anita to grab me my other shoes. She ran off to the car while I sat eating and a guy from Glasgow asked me if I could take his photo. He'd cycled from Glasgow and wanted a photo to prove it to his friends before getting the train home. 'No I don't want to take your photo, thank you very much. I want to sit here and feel sorry for myself while eating some custard' I thought to myself as I cheerily took the camera off him and said 'No problem, what would you like me to get in the background for you?' He was a really nice man and I enjoyed the little chat we had. Anita came back with my shoes and after a quick change I was off again. I got 300 yards out of the checkpoint when I decided I'd had enough. I stopped for about 15 seconds and decided I was going to go back and go home. Then I thought about the previous 33 miles and how hard they were. On the Friday morning Anita made a joke about staying in the house all weekend on the sofa with our cat and not going to Glasgow. My thought was that if I dropped out now then we may as well not have made the trip. Decision made. I decided to carry on but at a fast walk pace. I managed to march all the way to the next checkpoint (42 miles) doing 15 minute miles. It was miserable but I got there. Once I was there I knew I wouldn't drop out so this was a bit of a moment. I knew I had to finish. The next checkpoint was only 5 miles away but these were the longest 5 miles of my running life. They were almost entirely spent walking as my feet, and in particular my two little toes, were in so much pain. My walking was getting slower so it seemed to take forever. A couple of runners caught up with me and asked if I was alright but I told them I'd be finishing and to crack on. Every single runner who passed me towards the end was very nice. They really are a friendly bunch these ultrarunners. Last checkpoint (47 miles) and last push. I made this checkpoint cut-off by 10 minute and knew that at the pace I was travelling there was no way I was getting to the finish in time. I would have to run 10 minute miles to beat the cut-off and I could hardly manage to get below 15 minute miles when I tried to run. I was getting fed up and tried to run a lot more in this section. I just wanted it to be over. I reached the outskirts of Edinburgh and started recognising some places from when I lived here about 10 years ago after finishing uni. I had never walked the canal so I was still a bit disorientated. The path was now full tarmac and had LED lights buried into the path to show the edge which was handy as it was getting pretty dark. It wasn't until I saw a shape move near my feet that I put on my headtorch to see the path was full of toads. Every 10 meters or so there was a toad sitting on the path. Not moving, just sitting there. So the next few miles were spent running along moving my feet at the last second to avoid squashing a toad which also made me put more pressure on the injured toes on both my feet. I passed a few neds (chavs) along this path but they didn't even acknowledge me which suited me just fine. With about 2 miles to go two runners caught me from behind and said they would run in with me the rest of the way, I think this was due to the aforementioned neds and safety in numbers. We could see the finish line from a long way off but it seemed to take forever to get there. As I crossed the finish line I punched the air but I think I was more relieved than elated. I was just glad I could stop. As a firm fan of the Yorkshire dales an excuse to visit the area is generally seized upon, with gusto , and the chance to get a few extra miles prep for the upcoming Swaledale marathon made this new event one not be missed for me. The start is just outside Reeth down, that's down, by the river and the run heads up (approx 600 feet of up ) toward and onto Fremlington edge. From here it's a skirt across the top, heading North West (I think) up another climb before a near vertical, and frankly to this Tarmac trotting Princess, terrifying drop that involves clinging to grass, rock or just to dear life. Then a fast section of track that's part of the C2C for a mile or so before another climb, which completes the upward tally of over two thousand feet, at this point I'd no idea of location as lack of oxygen was causing hallucinations,with a good 2 1/2 miles of drop and flattish trail. Spotted at the start were Corrina James, Anita Clementson and Phillip Connor and words uttered at the end all seemed to affirm my view that it's a very tough course but excellent fun. It also gave excellent value a cracking run,technical tee, water bottle and free tea and cake at the finish. The organisation and marshalling were near faultless and very friendly. A great, hard run that leaves me looking forward to the next two in the series, I'd heartily recommend them to all. Saturday the 4th April saw Karen, Issy and I participate in our first international parkrun. Saturday is not Saturday if it doesn't start with a parkrun, and even the 7:30 start did not put us off. Staying in Davenport made it easy, a trip down the U.S. 27 North found us in the small town of Clermont. Past the Heritage Village and the race start was right on the lake side. The ethos of parkrun prevails and we were greeted warmly and made to feel welcome. Quite a few other Brits had made the effort also, Basildon, Sheffield and Darlington to name a few places we all came from. Our first view of the course indicated that it was flat and fast and quite probably a PB opportunity, Karen however was running with Issy and, if you can believe it me, whose first items in my suitcase were running kit and shoes, had forgotten my garmin, but thought perhaps that should not stop me. After the briefing, not quite up to Robson par (but then I probably am biased) we were off. A straight run out for 1.25 miles took us to the first turnaround, we came straight back past the start to the second turnaround then directly to the finish line. As I was approaching the finish Karen and Issy were passing and heading for their second loop out when Karen shouted I think you have smashed it and that it was definitely sub 23. I knew I had run hard but being Garminless meant I would just have to wait for the official results. Karen and Issy finished in a very respectable 31:41, I did smash it, first in my age category, 2nd lady overall and a PB to boot 22:32 on what was a very hot morning, and just to finish off our parkrun experience we joined the team at Cheesers a local restaurant to enjoy breakfast and chat. 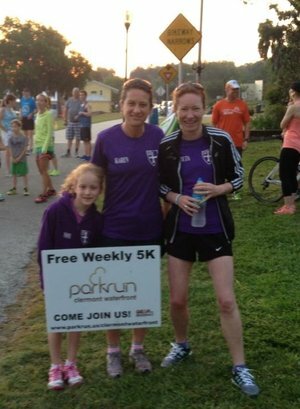 We were very pleased to note that we have now increased the Striders participation in Clermont parkrun to a grand total of 3, Megan Bell being the first, however we also noted that Blackhill Bounders have a total of 6, so come on Striders if you find yourself in Florida, pay a visit to this wonderful parkrun.